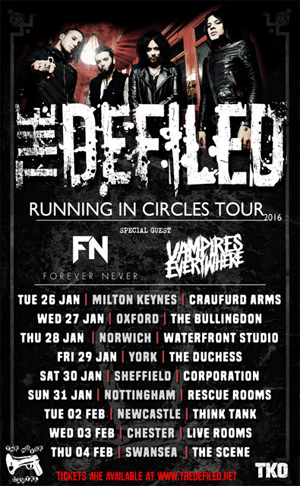 It's been over a year since their last headline UK tour and now The THE DEFILED have announced a run of headline shows in January and February 2016 following a short run of dates as main support to IN THIS MOMENT. 2016 will also be a record breaking year for the band when the four piece are officially added to the Guinness Book Of World Records. Braving arctic conditions, THE DEFILED became the first band to play a gig on an iceberg last year as part of Jagermeister’s Ice Cold Gig series. The stunt will be immortalized forever in the 2016 Guinness Book Of World Records. Tickets for the tour are on sale now right HERE.